Couples Shower invitations to celebrate together. Modern and rustic Couples Shower invitations and Honeymoon Shower invitations for celebrating your wedding shower together as couple. 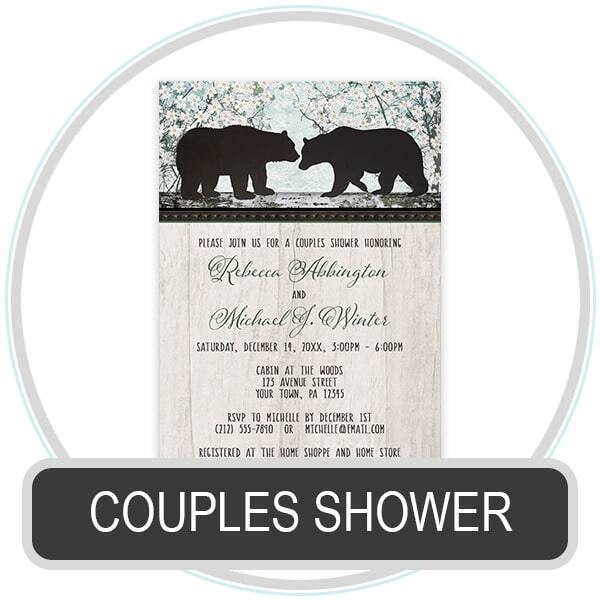 Popular designs include beach honeymoon shower invitations, bear couples shower invitations, sunflower "I Do!" BBQ Couples Shower invitations, and more. You'll find a variety of themes and designs, and invitations that cater to all four Seasons: Spring, Summer, Autumn (Fall), and Winter. Nearly any invitation design can be worded for any occasion. Simply provide the wording you require to fit your occasion or celebration. Included in your order is a complimentary proofing process with the designer. This means that you will be emailed a proof image of your invitations before the are printed, for your review and approval. This allows us to get your Couples Shower invitations just as you want them.